The single most important thing you can do in this life, is to marry the right person, in the right place, by the right authority. It is only through our relationships, most importantly with your spouse, that we will find happiness in this life and the next. 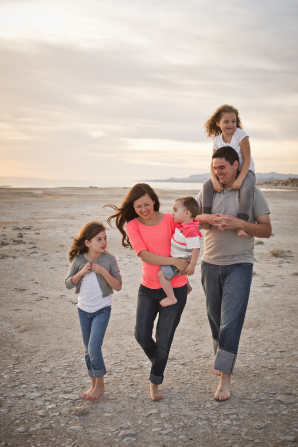 Our family relationships is where we will find our greatest joy. I am so grateful for marriage and families. As I look at my life there is nothing that has impacted me more than the family that I grew up in and the family that I am now a part of. I am so grateful for my wife and the family we are building. I am so grateful for my mom and dad for making that commitment and sacrificing for me. A happy marriage is a choice, it takes work. 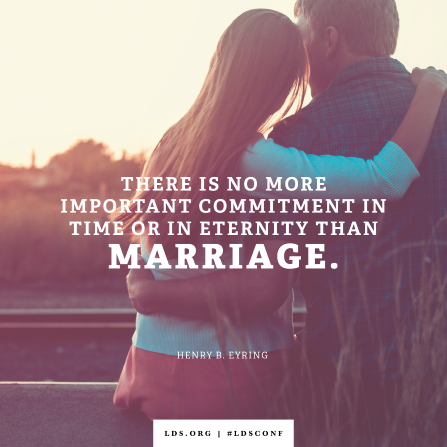 Dieter F. Uchtdorf has said that sadly marriage has become akin to the many cell phones or automobiles that at first are exciting and new but we quickly tire of and feel the need to upgrade to the "next best thing". But as both partners in a marriage follow the principles in this inspired document, making sure the Lord is at the center of the home, the next best thing can be here and now with the person you chose in the first place. Trials won't go away. Disagreements will still happen. But with God as our guide, marriages and families become even better than the latest Samsung or Apple phone. :) And that love is eternal.